With less than 2 weeks to Mother's Day I thought I'd share what I've bought for my mum and a few more ideas for ways to treat your Mum on any budget. 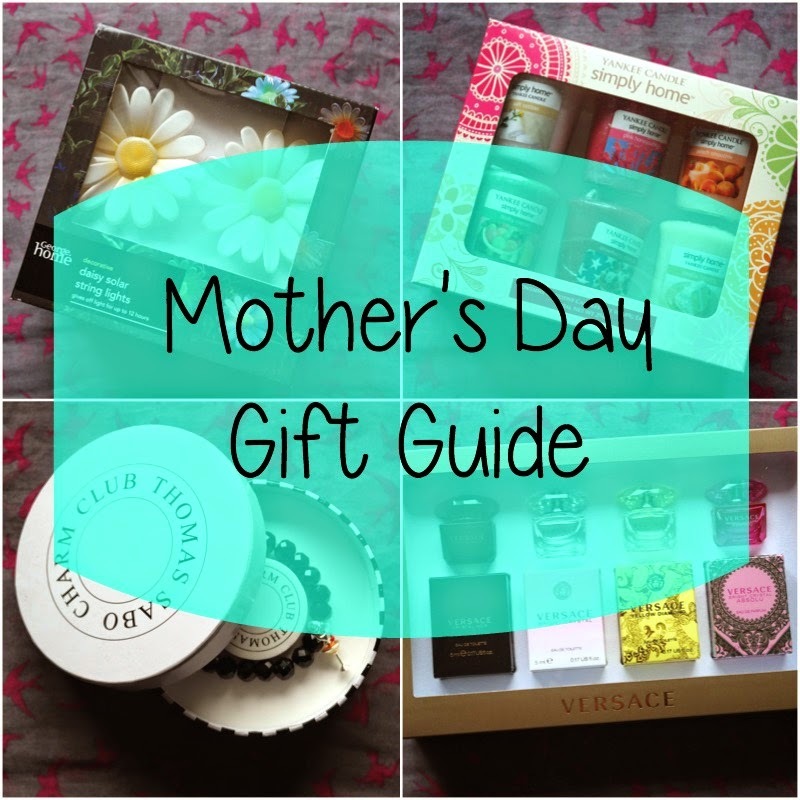 Whether she's into beauty, fashion or homeware I've got some ideas to help spoil your Mum this year. My Mum loves flowers and all things to do with her garden but with the weather we've got just now she'll not be spending too much time out there. I was tempted to buy a bunch of flowers for her until I spotted these Daisy Solar lights in Asda. There was quite an impressive range of Garden stuff in the George Home section and this combines the garden and flowers. These daisy lights look adorable and will last a lot longer than a bunch of flowers. At only £10 they're a bit of a bargain too. Giving fragrances are a fantastic way to treat someone. My Mum never buys herself perfume so buying her perfume is always a must.If you're not sure which perfume to go for a miniature perfume set is always a winner. I bought my Mum the Versace set from Boots and hopefully she'll discover a new favourite. This will be great for our Summer holiday and for popping in her handbag the rest of the time. If you'd rather go for a big bottle of perfume I'd recommend Jimmy Choo, I think I'll be buying that for my Mum's birthday - it's a yummy one. You can't go wrong with candles for girls and my Mum is a big lover of Yankee Candles. I got this 6 set of Simply Home Votives from Asda for only £6! I'm looking forward to her trying them all out and hopefully finding a new scent. The colours and flavours are all really bright and Spring-like, a nice change from the winter scents that she's been using up recently. My Mum takes good care of her skin but never really splashes out. One of the best things to splurge on is a Magnitude Lucid. I've had mine for around 2 months and love using it. If you've got a bigger budget for your Mum this year then I'd highly recommend one of these. A cleansing brush for your face that's totally waterproof, that gently exfoliates, reduces pores and leaves you with a brighter complexion. A lovely treat that can be used everyday. The only hard part would be choosing the perfect colour! Jewellery is always a lovely treat and I think a Thomas Sabo bracelet and charm is a fab way of making it personal. At only £30 for the bracelet it's an affordable designer and the huge range of colours means it's easy to suit everyone's style. They've got some lovely Mum charms in especially for mother's day or perhaps a fun charm like the cocktail glass would suit your Mum better. Whatever your budget it's easy to spoil your Mum this Mother's Day. What's your plans for Mother's Day?